I’m the publisher, editor and designer of Offscreen Magazine, a publication that explores the human side of technology and the web. I’ve come to the publishing world by way of digital/web design. Until launching the inaugural issue of Offscreen I had no prior experience in designing or publishing printed media. Even after producing fourteen issues of Offscreen, I still consider myself a noob in this field — there is still so much to learn! The mistakes I make along the way I usually record on my blog. Over the last few years I’ve given numerous talks about what indie publishing means to me. This post is a collection of lessons I’ve learned about the business side of making Offscreen. The latest issue of Offscreen, No14. Details here. Every publication is unique. 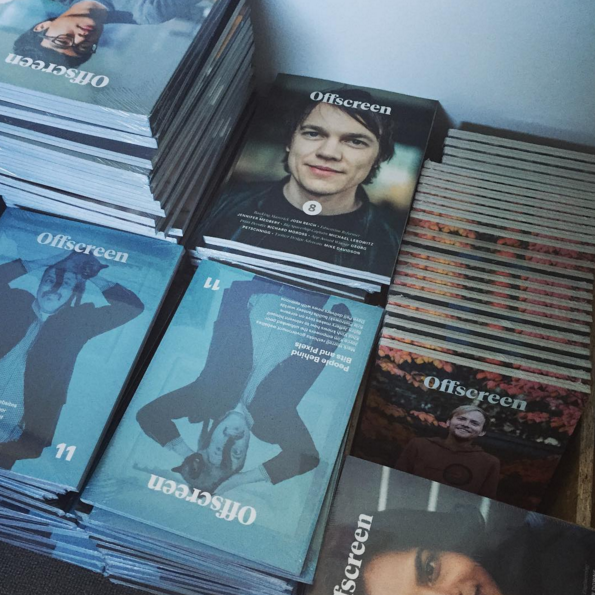 I believe Offscreen is in the very special position of being a print publication for digital folks. While many magazines rely on traditional distribution channels (i.e. retail stockists) for most of their sales, I can directly approach my readers and sell a magazine to them where they already are: online. In addition, Offscreen is a magazine that consists largely of first-person stories, opinion pieces and interviews that I collect by collaborating with my contributors directly online. As such, I rarely commission writers or journalists. These are all factors that impact the bottom line — how I make money, where I spend it. All this is to say that what works for me, might not work for you. Obviously, there is no golden bullet when it comes to creating a sustainable print publication. Everyone has their own approach. This is mine. Just like on the web, content is king. You don’t have a magazine if you have nothing to say. Leaving the definition of content aside, the food for thought served to your readers is what defines your magazine. Not the paper, not the typeface, not the cover. Good content, be it written, photographic or illustrated, obviously comes at a price. If you publish an outdoor adventure magazine, you might spend a lot on photo licences. If your mag is a collection of short stories, you might be paying a lot of different writers for their contributions. Whatever it is, you will have to decide early on how much content goes into each issue and how much money you’re able to spend on that content, not just for the first issue, but on a regular basis. A lot of new publishers make the mistake of trying to fit too much content into their inaugural issue. Keep in mind that you will have to generate similar amounts of content for each consecutive issue. Is it realistic to generate the same amount of content within each publishing cycle? Think about how you locate your contributors/your content. There is nothing wrong with re-publishing existing content, if you can get permission and think that it is still fresh content for your specific audience. Republishing content can be a great, affordable way to resurface quality material and introduce it to another medium and audience (think online/offline). You can also add value by, for instance, commissioning a set of new illustrations for an existing story. Deciding whether your issues are topical (meaning that each issue focuses on a particular theme) and determining whether your content is timeless or time-sensitive are factors that will make finding contributors more or less complicated in the long term. The question of how much to pay contributors for their work depends on your individual circumstances. If you’re not making any profit with your magazine (the so-called ‘passion project’) it might be easier to convince contributors to help out for free. If you recycle content or don’t ask for exclusive usage-rights, the fee might be a lot lower or non-existent. Some writers, photographers or illustrators might be happy to start with a very low fee that increases as your publication gains popularity and a wider audience. As for Offscreen, I generally don’t pay someone for letting me interview them. A lot of entrepreneurs and creative types talk about their own companies, projects and opinions in Offscreen, and I usually don’t pay for those stories (and, frankly, I’ve never been asked for a payment). I usually offer to pay for new material, be it longer essays, photos or illustrations, but, to be honest, my budget is always very modest. The hard truth is that most indie publications rely on a lot of favours by a lot of generous people. Virtually every publisher I talk to tells me that they wish they were in a position that allowed them to pay everyone fully and fairly. The reality is that — bar a few exceptions — small-scale indie publishing does not make a lot of money, and that is reflected in the fees paid to everyone involved in the making of an issue. While most of us try to offer something, it hardly ever is the full rate that contributors would charge larger clients. Due to the abundance of content online, there is a certain satisfaction in seeing one’s work in print, and this up-valuing of the medium makes some contributors look past the financial return and work with the meagre budgets of the indie publishing world. If you’re totally uncomfortable with asking people for favours, indie print publishing is probably not your cup of tea. 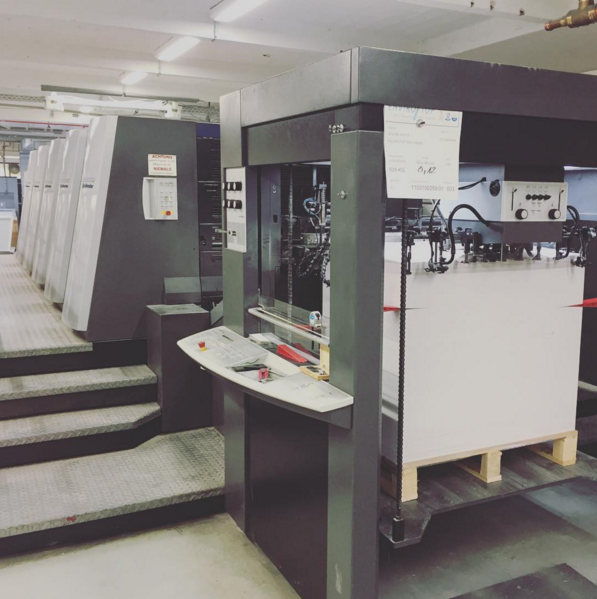 Production of issue 13 in Berlin. 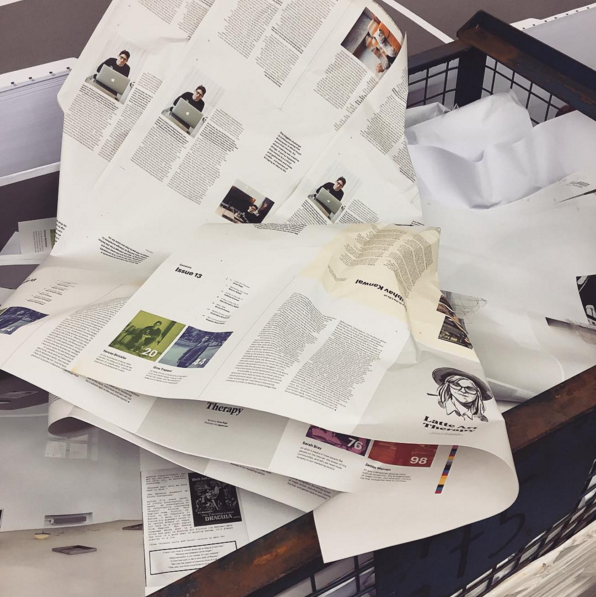 There are so many stressors in making magazines, the last thing you want is to lose sleep over the production once the files are out of your hand. That’s why finding a reliable, trustworthy printer is crucial. Having said that, no production will ever go 100% perfect. There are always minor issues and delays, at least that’s been my experience so far. More on picking a printer below, but let’s first look at the different elements of a quote and how they impact the cost of printing. If you print anything less than, say, 500 copies, offset printing might be too expensive for you (or printers simply won’t be interested). In that case you may want to look at digital/on-demand printing. Digital printing is an entirely different beast which I’m not very familiar with. In most cases an offset print job is using four colours (CMYK), sometimes five and very rarely six (so-called spot colours). Obviously, the more colours the more expensive, although there generally aren’t any big cost savings in printing with fewer than four colours, unless of course it’s just black. The higher the print run the lower the per-item cost. A lot of indies start with 1000–2000 copies. I started with 3000 for my first issue, but it did take me more than a year to sell them all. If your magazine is fairly timeless, having a large back issue catalogue is a great way to increase your cash flow further down the line. Almost every second order I get includes back issues, so you definitely don’t want to sell out within the first week. Only after having produced a few issues will you have enough sales data to figure out what number is about right (and hopefully it’s increasing too). But even then, some issues will always sell better than others. There are no rules as to what shape or format your magazine should have. 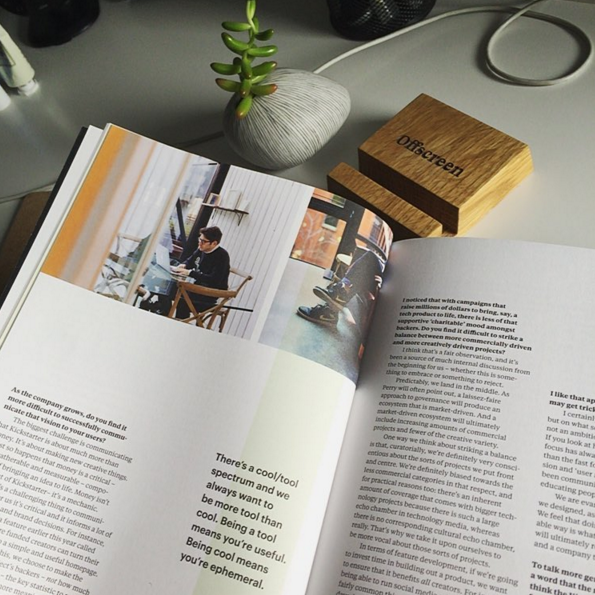 Your publication can be as small as a postcard or as large as a newspaper. There are some important considerations when choosing the ideal size. First and foremost, you should go with what you personally like and what you think your readers will appreciate. Publishing a travel journal that people read on the road in a newspaper-sized format might not be the best idea, but then again, maybe it is!? When discussing the paper stock with your printer (see below), they’ll be able to tell you what sheet sizes are available for the stock you’re interested in. Some paper types only come in ‘standard’ sizes, some can be ordered in irregular sizes. Offscreen uses a custom sheet size, which means my printer has to order it in four to six weeks in advance and purchase a bulk amount, enough for at least two issues. The sheet size is important because it will determine how many pages/spreads of your magazine the printer can fit on one sheet. There is always a chance that changing your format by a few millimetres means more pages can be printed on one sheet, reducing the amount of paper necessary and thereby reducing the total cost. 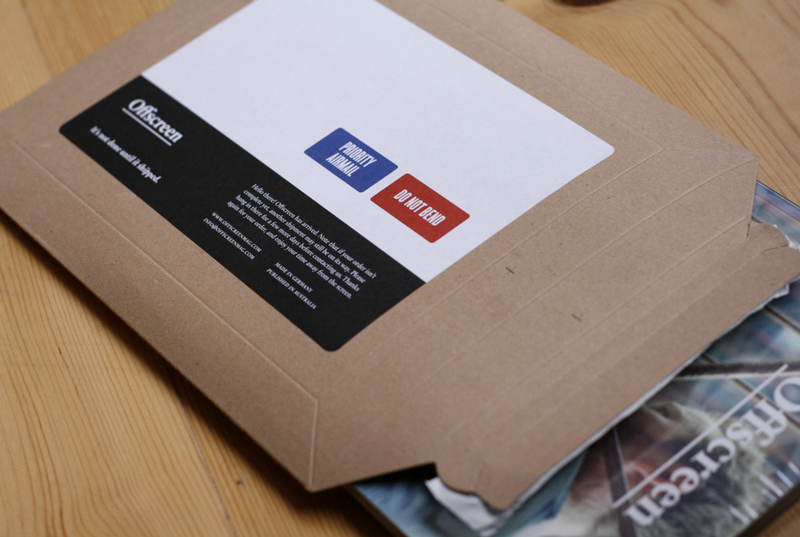 The final size and weight of the finished magazine can have a huge impact on shipping costs. This is important to keep in mind and is often overlooked at this stage. More on that further below. Closely related to the format/size of the magazine, you’ll have to determine how many pages you need to present your content. As a general rule — depending on the binding/cutting method used — it’s most economical and practical to calculate in eight- or sixteen-page steps. Therefore, producing a magazine with 96 (6 x 16) pages is more economical than producing one with 92 or 100 pages. Most of today’s magazines use a glue-based binding technique called ‘perfect binding’. In terms of cost it sits somewhere in the middle between staple binding at the lower end and stitched binding on the higher one. Your printer can offer different options, but the default will most likely be ‘perfect bound’. I love exploring paper types. It’s a huge topic to cover in its own right and I’ve had my fair share of good and bad experiences with the paper choices I’ve made in the past. Your printer will have access to many different stock types, ranging from cheap, standard xerox quality to really fine, luxuriously tactile paper. You’ll be surprised about how many different types there are. It’s helpful to just browse through some of your favourite magazines and pay attention to the paper they use. If the colophon doesn’t make a note of it, email the publisher and ask if they can share the name of the paper stock and its manufacturer. Note that the availability of certain types of paper is limited depending on your location. It’s also quite common that the names of a specific paper changes if you request it through a different wholesaler. Your printer can help. Don’t be shy to ask for samples. Personally, as someone who is always concerned about the environmental impact of printed media, I spent a few days researching the benefits of using 100% recycled paper. There are pros and cons, but I eventually found this Austrian manufacturer who has a really unique and transparent approach to their recycling methods that makes me feel good about buying their products. I’ve been using their paper (called Envirotop in Germany) for the last eight issues and am really happy with it. You can go crazy with special finishes like embossing or die cutting, or adding things like a dust jacket to the magazine. Easiest to ask your printer for what options are available. It’s tempting to go overboard with special finishes (if you can afford them). I personally always preferred a rather conservative application of them because they can quickly turn your magazine into a novelty item. In today’s interconnected world we don’t have to print where we design the magazine. In fact, I edit and design the magazine in Melbourne, Australia, and print it half way around the world in Berlin, Germany. There are several reasons for this: cost, quality, logistics. Australia is a very expensive country. As much as I like to support local businesses, it’s just not feasible to print Offscreen here. Based on a few quotes I received from Aussie printers, the final cost was around 25–50% more expensive than their German counterparts. Also, Germany has a long history of printing and making printers. They are known for being very reliable. The competition is high, so the quality is good and the prices are fairly low. Added benefit: I speak German. The most important reason for choosing Berlin as my place of production was a logistical one. I knew that most of my copies would be sent straight to readers around the world. That meant that I had to find a place that offers affordable international shipping. Australia is not one of those places. More about that further below. One other aspect to keep in mind if you print outside of your country: currency fluctuations. If you pay your printer in a different currency than your own, the production cost will be going up and down over time. This can work for and against you, obviously. 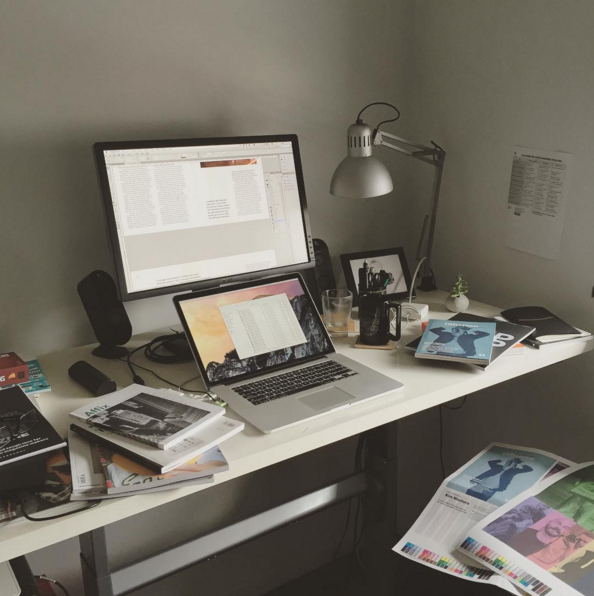 When it comes to getting your magazine to your readers, there are mainly two ways of doing that: you self-distribute your magazine, meaning you do all the shipping, or you use a distribution company that gets your magazine stocked in retail outlets. Most indies use a mix of both methods. Self-Distribution basically means that you are responsible for getting the magazine to your readers. It doesn’t necessarily mean that you have to convert your bedroom to a warehouse, although that is often the inevitable side effect. Since I print Offscreen in Germany (and live in Australia) my stock is managed by a third-party fulfilment company based in Berlin. They warehouse my entire back catalogue and send out orders once a week. More on that below. Before we talk about logistics, the bigger question here is: how do you reach your customers? How do you get them to buy your magazine? If not through retail outlets, then online is your best option. The great thing about selling directly to your reader is that you can keep close to 100% of the profit. When it comes to taking and managing online orders, there are lots of options. You can go with a standard website package, like Squarespace, Shopify, Big Cartel, Wordpress and the likes. All of them offer fairly affordable and straightforward shopping cart solutions. While selling single magazines can be easily done through these apps, when it comes to magazine subscriptions it gets a bit trickier. Most indies still rely on a spreadsheet to keep track of who ordered what and when. There are some tools that could help you with subscription management, but I haven’t tried them. For Offscreen, I created a custom order management system that runs in the background of my website. It allows me to easily manage all orders, including subscriptions and pre-orders, and it gives me a simple interface to export weekly orders ready to be processed by my shipper in Berlin. Developing that system with the help of a developer friend wasn’t cheap, but it makes my life so much easier now, it’s worth considering the investment in a custom solution that fits your requirements. Ask anyone who sells physical products and they will tell you that one of the biggest challenges is getting the product from A to B. Shipping is hard. When it comes to shipping, there are two main things to consider: postage and packaging. Postage depends on the size and the weight (and the speed of shipment, but let’s assume we’re going with the default). Unless your magazine is a hefty 5Kg monster, it will most likely still be categorised as a ‘letter’ by your postal service. It’s super important to know the pricing tiers of your local postal service. In Germany, the upper tiers for letters are: up to 250g, 500g, 1Kg, 1.5Kg, 2Kg. This means you can send a magazine of up to 2Kg and it’s still technically considered a letter! Why is that important? Because sending a letter is much cheaper than sending a parcel. It’s also crucially important to keep these postage tiers in mind when determining your magazine’s format. If your product ends up weighing 510g you will have to pay the 1Kg postage tier. That means shipping will be twice as much compared to a magazine that is perhaps 1cm smaller in size and only ways 480g. Don’t forget to add the weight of the packaging though! If your $10 magazine costs $15 in shipping to get it to your readers’ doorstep, people will think twice about ordering it online. As you can see, the dimensions and the page count of your magazine can make or break the entire project. I use sturdy, recyclable cardboard envelopes with a custom shipping label. Obviously the type of packaging you choose matters too. The goal is to find an affordable packaging solution that is light in weight, offers good protection, and ideally doesn’t cost the earth either. Shipping envelopes are often sold in bulk quantities and you’ll find that buying them in packs of 100 or more provides steep discounts! Besides the cost of printing, shipping will be your biggest expense. So it’s important to think carefully about where you produce and ship your magazine from. Being based in Berlin makes Offscreen a viable business, because printing and shipping costs are relatively low. I couldn’t do it from Australia. To show you what I mean: sending one copy of Offscreen from Melbourne to Berlin using the Australian postal service would cost around US$13.00. Going the same distance, but the other way around using German Post costs US$4.20 (both amounts are pure postage costs). I have no bloody idea how this discrepancy can be, but that’s the sad reality of global logistics. Besides sending individual copies to your readers, you can also approach specific shops that you think should stock your magazine. Many of them won’t reply, some of them will require you to use a distributor (see below), but some will be happy to take you on on a trial basis and deal with you directly. The usual deal is a 60/40 cut (you keep 60% of the cover price, they keep 40%). You are usually expected to cover shipping costs. This means you will be sending boxes of your magazine around the country/world and you’ll quickly realise how expensive that is! After some shipments that went missing or were badly damaged using standard postal services, I now send all of my boxes with FedEx. This is more expensive, but it comes with good tracking and they usually arrive safely after just a few days. Courier services like UPS, FedEx, DHL and the likes offer steep volume discounts that you won’t have access to if you only send the occasional parcel. It’s worth considering using a fulfilment company to get access to their discounted rates if you ship a lot of boxes. Bigger publishers usually work with middlemen (called distributors) to get their magazines in as many retail outlets as possible. Publishers enter into a contractual agreement with the distributor that define the terms of that relationship. A standard agreement often includes a 40/40/20 cut of the price of the magazine, meaning of every copy sold the publisher and retailer keeps 40% (each) and the distributor takes a 20% cut. These contracts are often exclusive, meaning that you can’t use another distributor in that same region. Once the publisher hands over the copies to the distributor, the distributor does the rest: distribution to his network of shops, invoicing the retailers, promoting the magazine, taking back unsold returns, etc. It’s not unusual to work with several distributors to cover different regions in the world. I have a distributor for the UK and a different one for the US, for instance. In theory, distributors are great. They work on a commission basis, so you don’t have any upfront costs (there are exceptions). They can get your magazine into a lot of shops that you otherwise wouldn’t have access to. However, you don’t need to be a genius at maths to realise that you are also ‘missing’ out on up to 60% of the price you charge for your magazine. Depending on your business model that might work just fine. However, most indie titles rely on the (fairly high) cover price to be sustainable, and so working with distributors might not always be your best option — unless, of course, the distributor can really drive up sales significantly. Based on my own experience, most distributors that I worked with are struggling to understand the dynamics of indie publishing. And I don’t really blame them! Their business model is based on a much larger volume of high-frequency mainstream titles, most of which are slowly disappearing. In an industry where margins are very low (and getting smaller) you can’t really expect great customer service. As an indie publisher with a print-run of just a few thousand copies, you’re not generating enough revenue to be all that important to distributors. The result is that you’re often dealing with long, overly complicated contracts, outdated reporting methods, slow communication, and delayed pay-outs. Since distributors always want to push sales (good!) they’re usually quite generous with the amount of copies they order from publishers. With a sell-through rate (actual amount of copies sold in the shops) that is often in the 50% region, you can expect to see half of the copies you send to distributors being destroyed as unsold (bad!). If you’re only printing 3000 copies, that’s a lot of your babies being pulped. 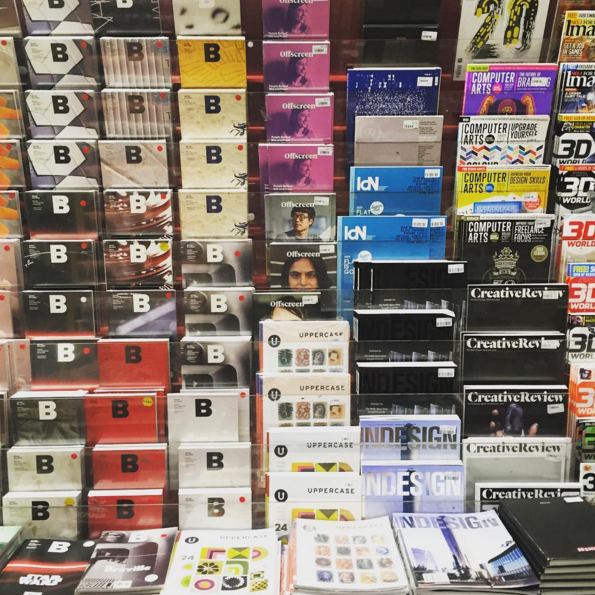 As an indie publisher it’s easy to be frustrated with the current state of magazine distribution. We’re too small to be able to make demands and too important to them to simply ignore us. I empathise with the difficult position they are in, though. It’s a volatile market environment with tiny margins. No doubt, shipping so many different items around the world is no easy job either. The reality is that sales through my own website generate a lot more revenue than what comes in through my distributors. Having said that, it’s difficult to know how many people first discover Offscreen through their local shops. Besides, it’s just lovely to see people in various corners of the world stumbling across my magazine in shops I haven’t even heard of. And that’s one of the main reasons for me to continue to work with distributors. The web remains my best sales tool, but that feeling of walking into a shop and discovering and falling in love with a beautiful magazine that speaks directly to you is part of what makes tangible products so great. Indie publications have always been respectable authorities in their niche. The clearer you define your audience and your niche, the easier it will be to stand out from the crowd and find a supportive, loyal community that is looking for a voice. By establishing who your reader is (and is not), you can tailor your voice/language accordingly. Another exercise you should do before spending any money on promoting your magazine is to make a list of what you want your brand to stand for. Create a set of guiding values that you can refer to for all big decision. All of your sales efforts (from design to marketing copy) should be in line with those values. Coming from the web design world, I strongly believe that print and digital can not just co-exist, but help each other thrive. In order to get there, we need to be mindful of the strengths and weaknesses of each medium. The goal of any brand is to reach as many of their customers directly, without any middlemen or gatekeepers. That’s why the web is the most powerful marketing tool at your disposal. A well-designed, responsive, user-friendly website is therefore imperative. If you don’t feel confident in your abilities to design or create a decent online experience, invest in getting help — not just in building a site, but in how to create and nurture an online community. Regularly creating fresh content for your website will attract new visitors, some of which you can hopefully convert to paying readers of your magazine. Many magazines choose to digitally (pre/re)release some of the content published in the magazine. Others create exclusive online content and sometimes refer/cross-promote to their magazine for extended coverage of the story. I’ve chosen not to publish additional content digitally, and instead created a blog that has become a sort of personal diary of my life as an indie publisher. I publish insights, experiences, and thought pieces on making a small indie magazine. All of the above (and indeed this very post) are different types of content marketing that can generate traffic and hopefully translate into magazine sales down the line. But beyond that, again, it’s a great way to establish yourself/your brand as an authority in a certain field. Frequent blogging, being open about what’s happening behind the scenes, and actively seeking a dialogue with your readers online helps to stay in touch with them in between issues. While it’s worth being on all the major platforms (Facebook, Twitter, Instagram being the top 3 in Western countries), I think it’s important to focus on one or two that you think will work best for your audience. In Offscreen’s case that’s Twitter. I also enjoy Instagram a lot, but it’s difficult to promote external content and elicit action on the behalf of your followers. Personally, I’ve lost all faith in Facebook as a tool for brands. It has no meaningful impact unless you pay to get in front of your followers, which, in my opinion, destroys the idea of creating a genuine dialogue with your fans. I follow many brands online myself, but unless I have the feeling that there is a well-meaning human being on the other end, I instantly unfollow them. The last thing I need is more thoughtless, corporate marketing messages raining down on me. With that in mind I communicate with my own customers accordingly: respecting their time/attention goes a long way. You therefore won’t find me rehashing the same queued-up marketing message several times. While social media can have a huge impact on your sales with close to no costs involved, I think we overrate the significance of large follower/Like numbers. I’d take 1000 loyal fans over 100,000 unenthusiastic followers any day. With social media stealing the spotlight, email has gotten a bit of a bad rap in the last few years. But no matter how boring or old-fashioned it seems, email is still the most powerful marketing tool for most online businesses. Engagement rates are usually much higher. And receiving a personalised email just feels a lot more intimate than skimming through a never-ending stream of social media soundbites. Collecting your customers’ email addresses should therefore be on top of your list. Sign up for a tool like MailChimp or Campaign Monitor and start gathering your customers’ details even before your full website is up. When it comes to sending out newsletters, similar rules to the use of social media apply: respect the time of your customers. Don’t feel pressured to send out emails on a regular basis. Only send out an update when you actually have something to say. I usually send out an email between two issues to update my readers on what I’ve been up to, and then another one when the newest issue has been released. I use Campaign Monitor’s API to link my customer records to my subscriber list. This way I can customise my emails and show each customer whether they are currently still subscribed or whether they need to renew their subscription. I also include a link to their order history page, where they can update their shipping address if they have moved in between issues. In my own experience, email trumps any other form of marketing. I send out a newsletter to my readers and within minutes orders are flying in. It’s worth investing time and money in building a reliable email template that looks good (on all devices!) and converts well. Initially I was very hesitant to send out free copies for review purposes, but as my back issue catalogue was increasing it felt less ‘painful’ to part with unpaid copies. I still don’t make enough efforts to approach blogs, magazines and media companies to review Offscreen, but when they request a copy these days I happily comply. Any sort of media coverage is usually welcome (and it’s always been positive so far). I also offer small amounts of free copies to organisers of web/tech/design conferences, usually 15–30 copies (some of them chip in with shipping costs) that they can use any way they like — as part of a give-away during ticket sales or as prizes during the event. This is a simple and cost-effective way to get the word out and surprise a few event-goers with a nice gift to take home. My home office in Melbourne. Pricing any product is tricky. There are lots of resources online that discuss various pricing strategies. It’s worth doing a bit of research, but in the end, your cover price needs to make what you do sustainable while not shutting out your core readers. Most indie titles are priced somewhere between $10 and $30, and I think most magazine aficionados are willing to spend around that much for a product they appreciate. The perception of quality and ‘bang for bucks’ obviously plays into readers’ willingness to open their wallets. Offscreen is a small-format magazine and so spending $20 on Offscreen seems expensive compared to larger format titles with a heavier stock. Of course, the size doesn’t say anything about the quality of the content, but it’s worth considering how the perception of quality impacts the price people are willing to pay. When selling your magazine on your own website, it’s pretty common to add shipping costs at the end of the checkout process. Keep in mind that this will deter some people from buying the magazine directly from you. It still fascinates me to what length some people are willing to go in order to avoid $5 in shipping charges. If your shipping cost structure is relatively flat, you might want to consider incorporating the shipping costs into the RRP (Recommended Retail Price), which is what I have done with Offscreen. Rather than offering a RRP of $18 and adding $5 in shipping cost on my own website, I priced Offscreen at $20 across the board and included shipping to anywhere in the world into the RRP. This way the magazine costs (technically) the same anywhere in the world, whether you buy it from me or from the shop around the corner. Open any magazine found on a typical newsstand and you’re likely having to flick through 20 pages of advertising before the ‘real content’ begins. For readers, the ad pages are usually considered a necessary evil. For publishers, however, those are the pages that make or break their entire business. A classic magazine offers a range of different ad formats, placements and sizes that determine the price for the advertiser. Those prices are usually hidden away in some ambiguous media kit with bloated circulation numbers and made-up market research figures. Just like in the digital advertising space, large companies employ ad agencies to manage their ‘media buying’ (that word!). Those ad agencies negotiate the actual rates with the publisher because everyone knows that the rates advertised in media kits are inflated and unrealistic. That’s my own perception of the state of advertising in printed media. As you can tell, I’m not a fan. Indie publishers tend to have strong ideals which don’t always mix with advertising dollars. That’s the general assumption. However, I’m not categorically against advertising. I believe readers generally don’t mind advertising if it doesn’t devalue the reading experience. And I believe that not all advertising has to be evil. It’s a matter of picking advertisers that largely align with your own values. The challenge is to find a way to bring your advertisers’ message across in a subtle, yet effective way while respecting the time and attention of your readers. Offscreen is trying to solve this by replacing ads with sponsors. The goal is to find organisations that understand the value of community building and that allow the freedom to weigh in on the artwork and messaging that goes into the ad pages. When I tried to find sponsors for issue one I reached out to companies that, above all else, I personally liked and respected and thought were accessible (and small) enough to reply to my emails. Having nothing to show for, I explained my ambitious plan for a new magazine and asked for a very low ‘trial’ sponsorship fee (I believe it was $400). That fee obviously grew with every issue as the magazine became more popular and the circulation number increased. 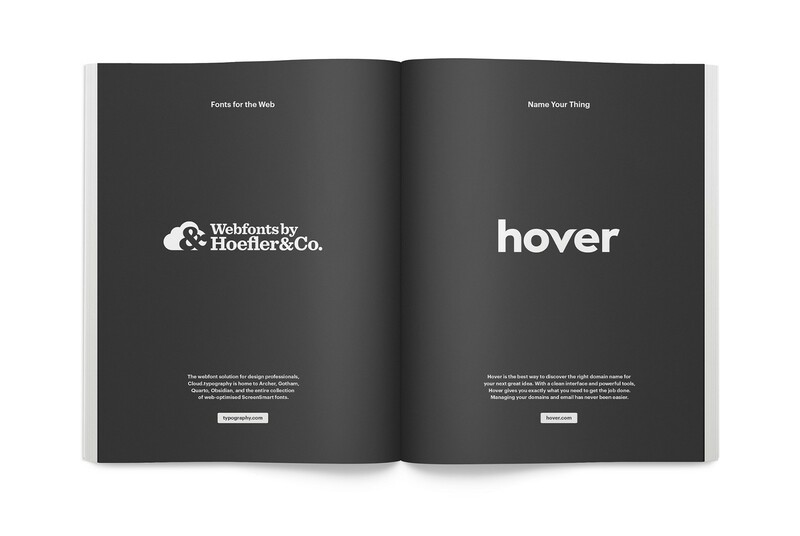 When I now approach companies (and all of them are non-traditional, digital product companies) about sponsoring an issue I’m upfront about the fact that advertising in print works very differently to advertising in digital. 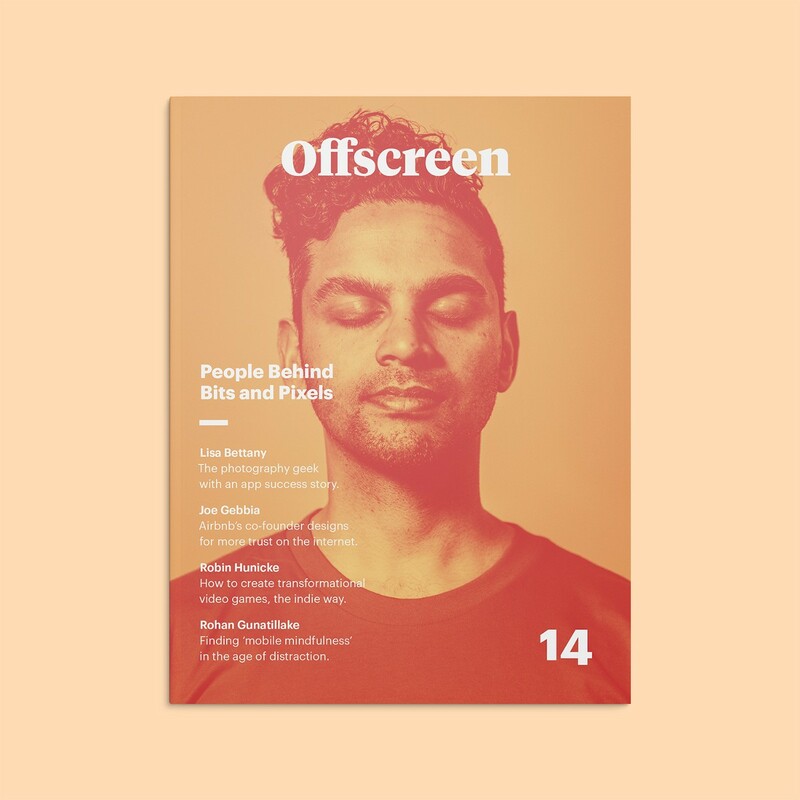 Sponsoring an issue of Offscreen gives companies a chance to capture the attention of a very thoughtful, creative group of web workers through a medium that’s removed from the fast-paced, low-attention-span screen environment. Because of this, over the last 14 issues, Offscreen has become a trusted brand in its own right, and my sponsors are paying to be associated with that brand and what it stands for (see ‘values’ above). There are pros and cons to the sponsorship model. I understand that this approach doesn’t work in all industries and with all advertisers. Fashion publishing, for instance, runs on wildly different rules and, weirdly, many people buy fashion magazines because and not despite of the ads. Unless you have good connections, I think in most industries only ad agencies will give you access to certain larger, more affluent advertisers. Decide early on how crucial the money that’s coming in through advertising is to your overall business strategy. If your goal is to sell the magazine cheaply (or even give it out for free), obviously a lot more time and effort would then go into finding valuable advertising partners. If your strategy is to only pay for the printing costs through a couple of ads in the magazine, this should give you more time to focus on other efforts to make a profit. If you go ad-free, you’ll rely entirely on the cover price and related efforts (see below) to make it all sustainable. My own strategy has been (and still is) to cover not just the printing but the entire production of the magazine through my sponsors. This includes fees for writers, photographers, and illustrators, the cost of proofreading and editing, the software I use, and everything else that goes into the making of one issue. This way, when the printer delivers the magazine, it’s completely paid for and I know that with every issue I sell I make a profit, and for every issue I give out for free I won’t lose money. It’s a very simple approach that has worked well for me this far. As you can tell, it’s important to figure out the true cost of each issue when establishing your sponsorship/ad fees. At a recent conference I attended it was said that indie publishers shouldn’t consider themselves as just makers of a magazine. They should consider themselves media companies, meaning that sustainability can be found in a ‘multi media’ approach where one channel supports the other and vice versa. Many publishers generate money through an agency business (creative client services) and use some of the profits to build and grow the magazine they make on the side. Or, a magazine could hold regular events that could entice advertisers to spend more money on an advertising partnership. 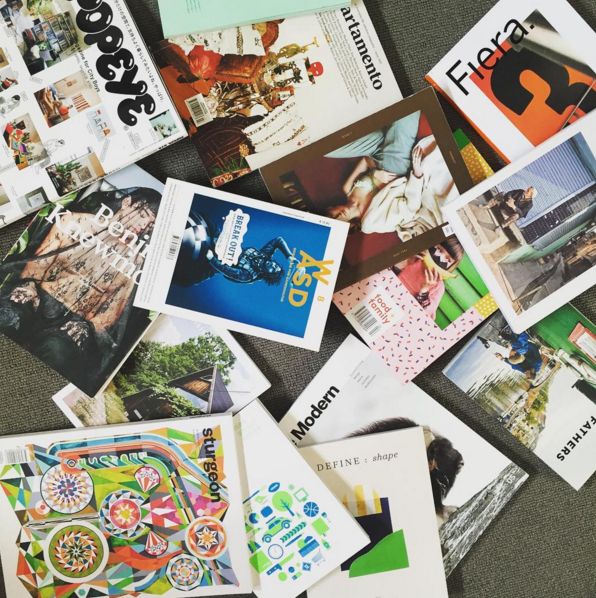 We see a lot of magazines extend their product range, like Kinfolk going into clothing or Cereal offering travel guides. If you manage to build a lively online community, there might be ways to monetise your digital audience too. Many of us get excited about the prospect of producing our own magazine. We immediately jump at the challenge from a creative perspective and often worry about the monetary side of things later. I hope this post helps you in understanding all the different aspects that go into creating a sustainable magazine that survives beyond issue 1 or 2. For more info on how to get started with magazine publishing, please refer to this blog post which covers the most important resources for magazine newbies. Please send in feedback, corrections and additions if you have any. 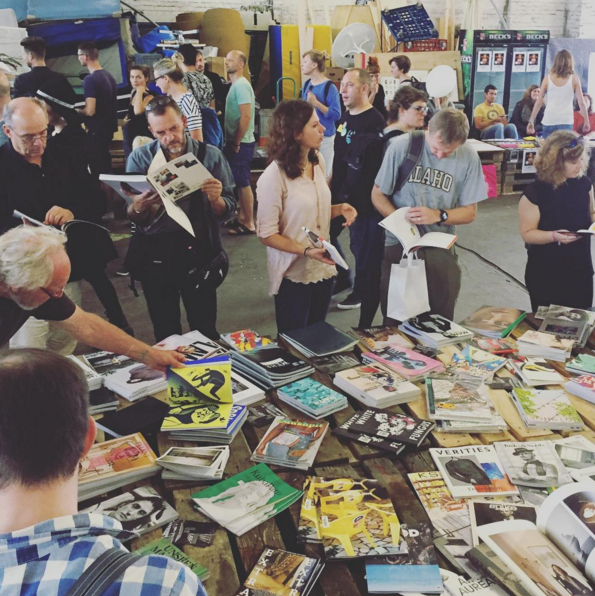 I also recommend you check out Heftwerk, a new, Berlin-based network of services that aims to make indie print publishing a lot easier (I’m involved). Follow Offscreen on Twitter or Instagram (or never see any posts of mine on Facebook). Lastly, I’d be a horrible salesman if I didn’t mention that you can show your appreciation for the many hours of work that went into writing this article by buying a copy of Offscreen and sharing this link.